The Spirit of Christmas is a community event. There is a snowmobile show and swap meet on Main Street. Trinity Church has a Silent Auction and Bake Sale. Along with a Craft/Vendor Sale at TCE School. There is live nativity scene along with a lighted holiday parade. Including the lighting of the official Christmas tree. Everyone is encouraged to join in our festive holiday celebration. Tractor Pulling Track is located at 1407 Range Road. The Boyceville Fire Fighters Association sponsor tractor & horse pulls each year. Area includes large parking area, lighted track, and concession stand. Northwest Public Shooting Range was created in 1981 through the courtesy of the Northwest Rod and Gun Club and The Village of Boyceville. The range is open when there is a supervisor there. Community Education offers many course and activities throughout the year for all ages. Please contact Alesha Kersen for more information @ (715) 643-3647 Ext. #240. Boyceville Public Library is located at 903 Main Street, (715) 643-2106, offers a reading group for 3-5 year old children and other great community resources. 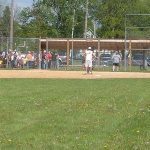 Andy Pafko Park boasts covered pavilions, a baseball diamond, tennis courts, basketball court, volleyball court, and several different types of playground equipment for the younger children and restroom facility. Freedom Park is located on Highway 79 just as you enter Boyceville. The park is great if you have a camper and would like a place to park and camp. There are several electric hookups and fire pits and one covered pavilion. Nightly camping Fee is $25.00 with electric and $15.00 without electric. Put the camping fee in the drop box located outside the Village Hall at 1233 Charlotte Street. No reservations are taken. Boyceville School Park is located behind the Boyceville High School. This park is a great choice for a family reunion, a group gathering, a picnic, or just a quiet place to relax. This park has two pavillions, numerous grills and a restroom facility. It is located next to Tiffany Creek and has a footbridge connecting it to the school property. The Boyceville School Park is adjacent to the Boyceville Football and Athletic Field.